Price: £1.25 (incl VAT) Sorry, this item is currently unavailable. Click here to receive notification when this product comes back into stock. 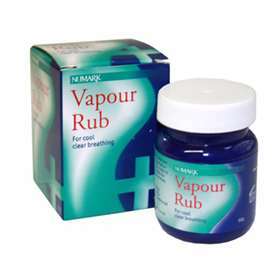 Numark Vapour Rub - For cool, clear breathing. Containing eucalyptus and menthol, Perfect for clearing nasal congestion. Numark Vapour rub is not suitable for children under 5 years of age alternatively there is Numark Children's Vapour Rub ideal for children over 6 months of age. Rub a small amount onto the chest, throat and back, and also below the nose, particularly just before going to bed. Alternatively (adults only), mix a little (2 teaspoons) in hot water and inhale the vapours for 5-10 minutes. Do not re-heat the mixture. Avoid direct contact with eyes. Do not place in nostrils. PETROLATUM, CAMPHOR, TURPENTINE, MENTHOL, EUCALYPTUS GLOBULUS LEAF OIL, MYRISTICA FRAGRANS, CUPRESSUS FUNEBRIS AND THYMOL. Product code: 2087104 Price: £1.25 (incl VAT) Sorry, this item is currently unavailable. Click here to receive notification when this product comes back into stock.